Palestinian media calls Har Nof terrorists 'heroic' in piece dedicated to 'epos' of murdering Israelis. Palestinian Authority (PA) news media celebrated the "first anniversary" of the Har Nof massacre earlier this month, Palestinian Media Watch reported Monday - calling the carnage "heroic" and an "epos written by the heroes." "Today is the first anniversary of the Martyrdom of... the heroes Ghassan and Uday Abu Jamal, who carried out the heroic Dir Yassin operation (i.e., Har Nof neighborhood of Jerusalem), which led to the death of 6 settlers," the Wattan news agency published on November 18. "Ghassan and Uday Abu Jamal exemplified the meaning of heroism for the homeland [...] They set out to protect it from the defilement of the thieving occupation, and died as Martyrs on the path of honor." "Today is the first anniversary of the epos written by the heroes." 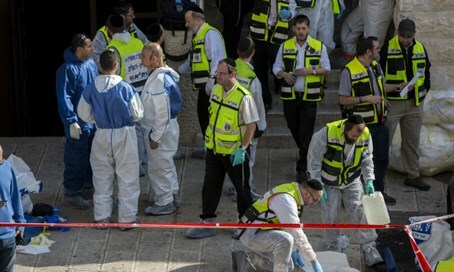 The report also praised another terrorist and family member of the synagogue killers, Alaa Abu Jamal, who last month deliberately drove his car into people standing at a bus stop in Jerusalem. After hitting three people, he got out of his car and started stabbing people. He killed one and injured three before he was shot and killed by a security guard. The news agency stated that "the Abu Jamal family again did not refrain from being an authentic part of the heroic honor," because Abu Jamal "ran [Israelis] over with a car, stabbed, took revenge, and upheld the promise, which the young people of the intifada undertake every day, to continue in the path of the Martyrs until liberation."